Become the Writer You’ve Always Wanted to Be! Do you dream of becoming a successful writer? Are you feeling stuck, or unsure about how to achieve your writing goals? 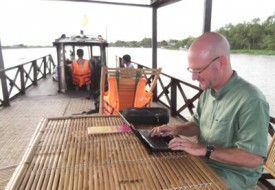 Boating down the Mekong Delta with a deadline. Yeah… I love my job. Hi. I’m Dave Fox. People sometimes tell me I’m lucky to be a successful writer, but it’s not a matter of luck. Great writing isn’t a “gift” a few magical people are born with. It’s something anyone (including you!) can master. A lot of aspiring writers don’t know how to make that happen, however. They believe that somewhere in their brain, they have what it takes to achieve their goals, but they don’t know how to get there. They have a passion for words, but when they sit down to write, those words come out jumbled, or not at all. They feel stuck, and they worry that if they don’t hurry up and figure things out, their opportunity for success is going to pass them by. “[Dave is] the best writing teacher I have ever had. Talented, funny, approachable, and structured.”Leslie in Surrey, EnglandI’ve been a professional writer for more than two decades. For nearly as long, I’ve been helping others polish their skills, overcome common mental challenges, and achieve their writing goals. I know what it feels like to toil over your words, wrangle with rejections, battle distractions and insecurities, and feel daunted as a new author trying to get published. I’ve slogged through those trenches myself, and flourished in the end. I’ve written two bestselling travel books (with a third on the way), published articles on four continents, won international writing awards, and been the opening speaker for another author – the Princess of Norway. My journey to these successes has been thrilling at times, tedious at others. I understand what aspiring writers go through. And as passionate as I am about writing, I’m equally passionate about helping others achieve their own writing dreams. There’s no such thing as instant success. There are, however, shortcuts. An experienced mentor can help you find them. As your writing coach, I can help you harness your strengths, fix your flaws, push past emotional blocks, and navigate the often confusing publishing world. I’ll get you on the right path so you’re not playing guessing games. You’ll write more confidently, knowing what you need to do to achieve your goals. I am also a certified life coach with specialties in goal fulfillment and personal happiness. If writing success is one of your big life dreams, and you’re wondering why it’s taking so long, let’s work together to make the process easier and more fun. You’ve got one life in which to accomplish your dreams. You owe it to yourself to get there! To learn more, open up the drop-down menus below. “Your critiques of my work are the best I’ve ever had! Your insight and attention to detail have helped me tremendously, and I thank you for that. Go get ’em, Dave!! !”Kelley in Chicago, Illinois Harnessing Your Strengths: The most successful writers develop a strong, personal, and consistent voice. When your favorite author puts out a new book, you’re eager to buy it because you already have a sense of how it’s going to flow. I can help you find and develop your own, personal style so you’ll stand out as unique. Fixing Your Flaws: The old “Practice makes perfect” cliché is misleading. Practice makes better. But sometimes, we practice and practice, yet we fail to notice habits that are weakening our words. Many of these habits are things we’ve been doing for years. They feel so natural, we don’t realize they’re holding us back. They would be easy to correct, only we are too close to them to spot them on our own. I can help you identify such habits, and show you how to fix them. 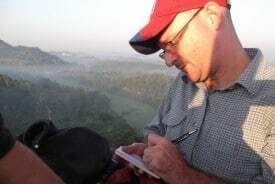 Taking notes in a hot air balloon over Hikkaduwa, Sri Lanka. Working with Editors: The publishing industry has its own rules of etiquette. Keep editors happy and they’ll ask for more. Irritate them and they won’t even look at your stories. But what if you don’t know the rules? Most writers, when breaking into freelancing, feel some anxiety over the right way to do things. From initial story pitches, to contract negotiations, to follow-ups and revisions, I know what you need to do and I can teach you to do it right. Navigating the Publishing Maze: I’ll never forget how terrified I felt when I received my first writing contract. I was thrilled I was about to be published, but I feared I might be agreeing to bad copyright terms. If your goal is to sell your writing, there are some basic business and legal matters you need to understand. I can talk you through your rights and responsibilities so you’ll be treated fairly. Taming Your Brain: This one is massive. Writing isn’t just a skill. It’s a psychological and emotional challenge too. We want to write but feel paralyzed by “writer’s block.” We want to get published but dread rejection. We feel distracted or disorganized. We have powerful tales that are tough to put into words. Family or time commitments clash with our need (yes, need!) to write. And the list goes on. Thousands of courses teach the mechanics of writing, but few address the psychological forces at play. Are your thoughts – conscious or unconscious – bogging down your success? I can teach you to sift through them and turn them around so you’ll write more, write better, and write more happily. Managing Distractions and ADD / ADHD: Why am I so convinced that untangling our brains will make us better writers? Because I’ve done it myself. When I was 16, I suspected I might have Attention Deficit Disorder. I asked to be evaluated. A psychologist, after a couple of hours of “aptitude tests,” gave me a response that was typical in the 1980s: She told me I was an intelligent underachiever who needed to quit goofing off and study harder. Fast forward 25 years: In 2010, at age 41, I came across a TV program about Attention Deficit Disorder in adults. That show blew my mind. It identified virtually every emotional issue I had tangled with in life, every productivity and organizational challenge, my erratic sleep patterns, and so much more. And it led me to revisit the possibility I might have ADD. It turns out that when I was 16, I was right. Being formally diagnosed at age 41 changed my life. Don’t let anyone tell you you can’t do stuff. This is where I ended up after four beginning swimming lessons. Attention Deficit Disorder isn’t entirely negative. I’ve published two books in spite of it — or perhaps because of it. People with ADD tend to have creative brains, big ideas, and quirky observational skills that supercharge our storytelling abilities. The trick is to understand both the strengths and weaknesses that affect our writing, to lasso those strengths and ride them, and to find effective “workarounds” for the weaknesses. We all live in a world of overstimulation. I hear people say all the time that they have ADD. Most are joking, some are speculating, and a few have been formally diagnosed. If you have ADD or ADHD, I can coach you on how to maximize the strengths it gives you as a writer, and help you tone down the distractions your brain throws at you. 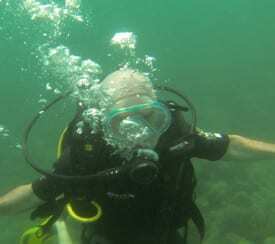 Genres I Cover: My specialties are travel, humor, and personal memoir. I have also worked as a radio and television journalist, and coached writers in everything from health and science writing to academic texts to (gasp!) even erotica. If you’re wondering if I can help with a particular genre, project, or challenge, drop me an e-mail. What About Fiction? I can coach fiction writers in elements such as dialogue, tightening and pacing, humor, and overall flow. There are some aspects of fiction I do not cover, such plot development and story arc. If you’re a fiction writer and want to work with me, tell me what your goals are, and I’ll see if I can help. As politely as I could, I explained that (1) I’ve got my own stories to write, (2) I know nothing about the topic he wanted to cover, and (3) I love beer and all, but it doesn’t pay the bills. Do you want to be a writer, or do you just want to be published? Lots of people say they want to write a book. In reality, most of them don’t want to write a book. Writing a book is hard. They just want to be an author – without putting in the work. My goal as a writing coach is to help people become better writers than they can become on their own — to help make writing less painful, to build their confidence, strengthen their skills, and fast-track their success. Chatting with me for a couple of hours will not make you the next [–insert your favorite author here –] unless you follow through. I can give you the tools you need. It’s up to you to work with those tools. If you aren’t writing much (or at all) because you’re struggling to find the time, the energy, the inspiration, or the guts, I would love to help you. If, on the other hand, you aren’t writing because you don’t really like writing, but you think it would be cool to be a published writer, please – for your own sake – do not hire me. Not everybody loves writing, and that’s okay. Our time in this life is limited and we shouldn’t waste it on things we find dreary. Everybody finds writing dreary at times, but some of us find it powerful and amazing at others. If you fall into that latter group, I would be thrilled to work with you. Goal Achievement and General Happiness: In addition to being a writing coach, I’m also a Transformation Academy certified life coach. I pursued my life coaching certification because I found many of my writing students had other issues in their lives that were affecting their work. In some cases, emotional and/or personal issues were holding back their writing. In other cases, they were writing about emotionally charged topics and needed help navigating the feelings their writing conjured up. I have studied the science behind what makes people feel fulfilled in life and why we do or don’t accomplish the goals we set. Self-esteem and self-talk– positive or negative – can play a major role in our quest to achieve success as we define it, and find true personal happiness. If you’ve struggled to accomplish creative or other goals, I can help you get to the root of what’s holding you back, and I can help you turn things around. 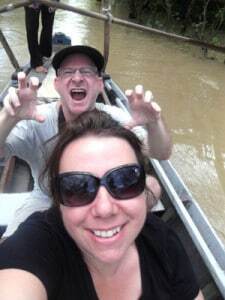 Life Coaching for Expats and Other Wandering Souls: Living outside your country of origin can be wildly exciting, but it comes with unique emotional challenges – from navigating the various phases of culture shock (an ongoing process, no matter how long you’ve been abroad) to managing relationships with friends and family back home. I’ve spent roughly 25 percent of my life overseas. I get what it’s like to live and seek a sense of belonging amid the backdrop of foreign places. International living can be a great adventure, but adventures aren’t always easy. If you’re struggling to find calm and contentment in a foreign place, I can help! I live in Vietnam, which might be far away from you. Also, as a travel writer, I’m on the road a lot. Luckily, we now have this cool thing called the Internet that makes distance irrelevant. I can meet via Skype, Facetime, e-mail, or phone. (International phone calls are cheap these days.) If you and I happen to be in the same place at the same time, I’m also happy to meet in person. I do my best to offer hours that are convenient for your time zone. Let me know where on the planet you are and we’ll find a time chat when we’re both awake. Ninety-minute appointments are also available for an additional $30 per session. Please note that I primarily work with adults, and teenagers with advanced writing ambitions, who either are native English speakers or have a strong command of English. I am not an ESL/EAL tutor. How long is a session? For each appointment, you get an hour of my time. Your hour might include some time I spend reviewing your writing before we talk. If you have a writing sample you’d like me to look at, I will typically spend 15 to 20 minutes going through it before our appointment, and then we’ll talk for around 45 minutes. I also offer in-depth, written critiques. For these paragraph-by-paragraph critiques, I spend one hour per 800 words and e-mail you my comments. My feedback is designed to help improve your overall writing, not just the story at hand. Satisfaction Guarantee: If we’re halfway through your first session and it isn’t what you were hoping for, we’ll wrap things up and I won’t charge you. You can pay online by credit card or Paypal. I also accept personal checks in US dollars, or cash in whatever the local currency is where we are. Single appointments can be paid either before or immediately after the appointment. Discount packages must be paid in advance and used within a year of purchase. Unused appointments are non-refundable. Missed appointments, and cancellations with less than 24 hours’ notice, will be charged at 50 percent of the normal rate. If you’re ready to dive in, or if you have questions, send me an e-mail. Please tell me briefly about what you write and what you would like help with. Please also let me know where you are in the world so I can give you a sense of the times I’ll be available in your time zone. We’ll schedule an appointment. We’ll talk. You’ll feel enlightened and motivated. Life will be awesome! Drop me an e-mail and let’s talk!